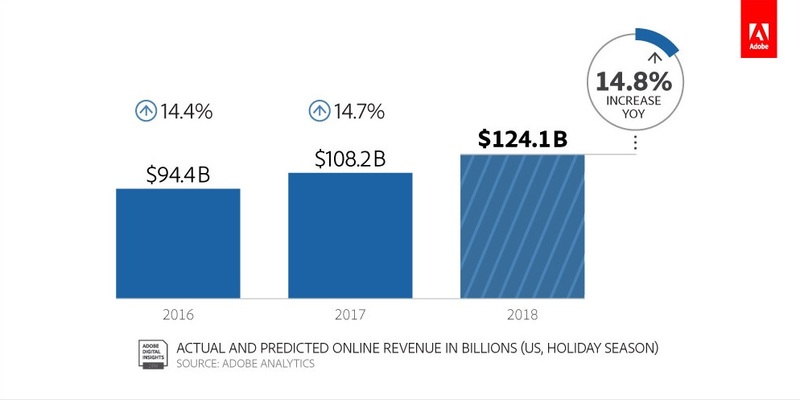 US online holiday sales will increase 14.8 percent, totaling $124.1 billion in 2018, while offline retail spending is expected to increase a modest 2.7 percent, according to Adobe's online shopping predictions for the 2018 holiday season (Nov. 1 through Dec. 31) powered by Adobe Sensei. Cyber Monday will set a new record as the largest- and fastest-growing online shopping day of the year with $7.7 billion in sales, a 17.6 percent increase year over year (YoY). Thanksgiving Day sales are expected to increase by 16.5 percent, generating $3.3 billion. Nearly one out of five dollars this holiday season will be spent between Thanksgiving Day and Cyber Monday, generating $23.4 billion or 19 percent of total online sales. One extra calendar day between Cyber Monday and Christmas Day will give retailers a $284 million boost in sales. A record number of days will hit new revenue milestones, with 36 days surpassing $2 billion compared to just 22 days in 2017. ■ Retailers with online and physical footprints are expected to see 28 percent higher conversion online in comparison to retailers lacking a traditional storefront. Adobe Analytics data anticipates shoppers increasingly buying online and picking up items in-store (BOPIS) during the holiday season. BOPIS has increased 119 percent since January 2018 across all retailers and over 250 percent for large retailers. A survey of over 1,000 U.S. consumers shows nearly half (47 percent) expect to browse in-store for a product they intend to buy online later, jumping to 58 percent among millennials. ■ Smartphones continue to gain share as consumers’ preferred devices for online shopping, representing 48.3 percent of visits and 27.2 percent of revenue. Mobile revenue is up 11.6 percent YoY. Yet, completed cart orders happen over 20 percent less on smartphones than desktop, as a result of abandonment from sub-optimal checkout experiences. Closing this gap equates to $9 billion in mobile sales. Consumers using mobile apps will spend more time browsing and complete sales two times more often than on the web. ■ Tablets are on the decline, making up 8.8 percent of visits (down 30 percent in four years) and just 9.6 percent of sales. ■ Voice-assisted shopping is on the rise, with 21 percent of consumers reporting they are planning to reorder frequently-purchased items and 17 percent placing one-time orders for in-store pickup using their voice activated devices. ■ Retailers will be able to capitalize on loyal customers that go directly to their website to make a purchase, with revenue per visit (RPV) rising the most at 36 percent. Search has the second highest RPV growth at 23 percent, followed by helper sites like RetailMeNot (15 percent) and email at 8 percent. ■ Social referral traffic will generate 11 percent less RPV compared to Q4 2016. It is the only marketing channel to see a decline in RPV, despite the increase in referral traffic coming from social. Adobe attributes this to consumers’ weakening trust in social networks. Shoppers are also expected to consult social media sites 25 percent less for gift ideas this year. ■ More consumers will stay home on Thanksgiving Day. Sixty percent report they won’t shop in stores on Thanksgiving Day, up from 40 percent in 2016. Survey Methodology: Adobe leverages Adobe Sensei, Adobe’s artificial intelligence and machine learning technology, to identify retail insights from trillions of data points that flow through Adobe Analytics and Magento Commerce Cloud, part of Adobe Experience Cloud. Adobe Analytics analyzes one trillion visits to U.S. retail sites, 55 million SKUs and 80 of the largest 100 U.S. web retailers. Adobe’s analysis spans large, medium and small retailers across over 50 merchandise categories, powered by Magento Commerce Cloud, to provide an accurate view of online shopping in the US. Adobe Experience Cloud manages more than 200 trillion data transactions annually. Companion research is based on a survey of over 1,000 US consumers in October 2018.